Car air fresheners eliminate odors and purify the air in your vehicle. Even though this is a rather simple item, many people can’t decide which is the best car air freshener they should use. So, we decided to explore this topic thoroughly and create a list of top ten products. We focused on the essential features of all car air fresheners: their value, effectiveness, and durability. The article is informative and objective, because we want to make sure that your find the best car air freshener for your vehicle. Little Trees is one of the best car air freshener brands on the market. You can choose between 35 different scents; our favorites are Sunberry Cooler and Black Ice. 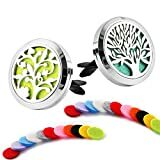 The Little Trees air fresheners are long lasting and inexpensive. However, these air fresheners sometimes lack the scent or emit very little of it, probably due to poor packaging. 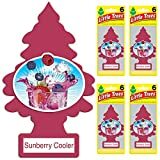 In conclusion, the Little Trees car air fresheners are inexpensive and durable, but we can’t recommend them to people who seek a car air freshener with a strong scent. The Febreze Hawaiian Aloha freshener kit includes four 2 ml clips. These are vent clips, which means that you should install them on the car’s vents. Each clip should last up to 30 days. The Febreze Hawaiian Aloha freshener is quite effective at eliminating odors in your vehicle. The freshening fluid is dense and safe for you and your pets. It doesn’t rinse nor corrode, and it will not emit any toxic chemicals. You can also control the scent-emmiting level by using the built-in control mechanism. The HumanFriendly air freshener is an ionic air purifier and odor exterminator. It is anti-microbial and deodorizing, which means that you can use it to remove smoke, mold, and pet and food odors. The product is the best car air freshener for people with allergies and asthma. It emits safe quantities of ozone, as well as large quantities of negative ions; the ions attach to the odor particles (dust, pollen, smoke, and so forth) and “shoot them down.” This air freshener also has two USB slots, which you can use to charge your devices while traveling. The Sensible Needs air freshener is the perfect product for keeping the air in your vehicle clean and healthy. 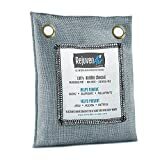 This product is both a purifier and an air freshener; it is made made of eco-friendly material and uses 100% Moso bamboo charcoal. The bamboo charcoal is stored in a carrying bag, which you can place in your home and vehicle. 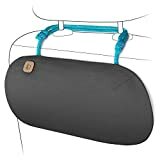 The bag features two holes so that you can hang it on your driving mirror. 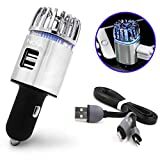 The product is purchasable in a 50g and 200g package and should last for two years, which is why it is the best car air fresener for people who seek a long-lasting purifier. The Humixx Aroma bar contains three scents (orange, lime, and olive) and can be installed on vertical and horizontal vanes in your vehicle. The product is eco-friendly and toxin-free, safe for you and your pets. The tube is robust and installs on all vehicle vanes. You can adjust the scent potency by rotating the bar using a built-in mechanism. The Humixx Aroma air freshener is quite convenient because you don’t have to replace the entire device once it is empty. Instead, you can open the tube and add your favorite essential oil in it, then repeat the process when it empties again. This particular kit features two products: the Febreze vent clip paired with the Gain Original Scent. The Febreze car vent clip attaches to any vent in your vehicle and can be controled with an integrated control mechanism. Inside the clips is the Gain Original scent, which eliminates food, pet, and smoke odors collectively. The item will gently release the oil to purify the air and refresh your vehicle. The product should last for 30 days on the low setting, less if you increase the output volume. One kit includes 8 vent clips. The Mesinya Air Freshener kit includes one vent clip, 14 diffuser pads, and a gift box. 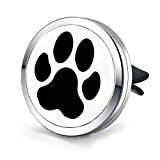 You can choose between several clip styles, but we suggest you go with the Dog Paw Pet Lover clip because it is the best-rated product among Mesinya customers. The stainless steel clip is 30mm in diameter, large enough to purify the air and remove any odors. The diffuser pads arrive in different colors, which is a beautiful design touch. More importantly, the diffusers won’t fade and will help clear the allergens in the air. Note that you can buy the diffuser pads separately once you use them (you don’t have to buy the vent clip again). The Five-of-Five car air freshener kit includes two vent clips and 22 diffuser pads. You can soak the pads with essential oils and insert them in one of the two lockable vent clips, which you then install on the car vane; you can use the other vent clip in your home or office. The pads are quality made, 22mm in diameter and 3mm in thickness, which means that they can absorb a lot of essential oils. The vent clip is made of stainless steel and should serve you for years, even decades. 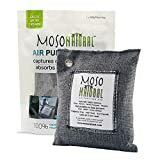 The Moso Natural bag contains Moso bamboo charcoal, which eliminates odors by sending negative ions in the air. The product is extremely durable and should last for two years. It is the perfect air freshener for cars, bathrooms, and offices. It is also the best car air freshener for preventing mold and bacteria accumulation. The bag is well stitched and made of eco-friendly material. Also, it features two holes on the top so that you can hang it on the driving mirror. The Purggo car air freshener is the best car air freshener on our list. Like the Moso air freshener, the Purggo features 100% bamboo charcoal and should last for one year! It is safe and free of toxins, and extremely effective at eliminating odors in your vehicle. 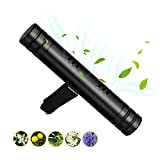 The product is also eco and pet-friendly, and can be used by people with allergies and asthma. It is also extremly simple to use; simply hang it in your vehicle and let it do its job. The Purggo car air freshener acts 24/7 without any required installation or activation. 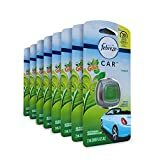 This review showed that buying the best car air freshener isn’t as simple as it once was, which is a good thing; it means that you have a lot of products to choose from! Speaking of the products, what did you think of our list? Do you agree with our choices? Let us know in the comments section below!